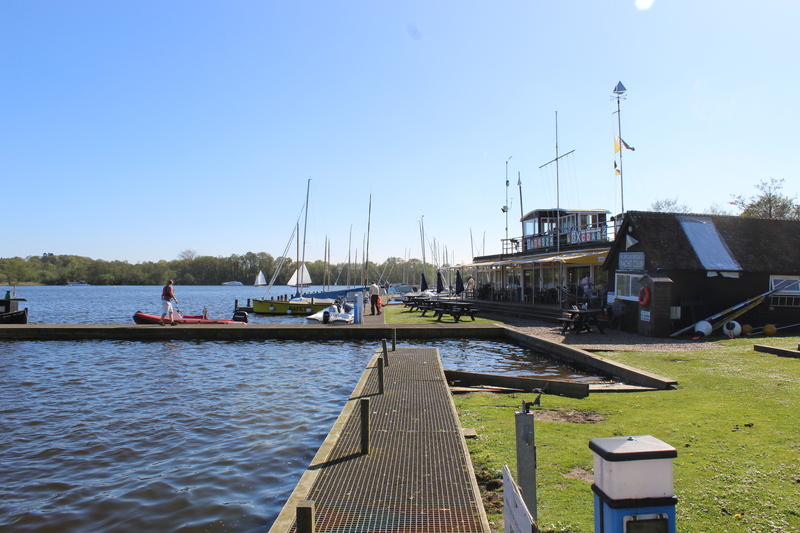 Last weekend, I travelled up to Wroxham with my camera and memory stick for the Norfolk Broads Yacht Club’s Open Day. They were celebrating life on the Broads in the 1930s, along with the books by Arthur Ransome’s that are set in East Anglia. We were blessed by such glorious weather that almost everybody seemed to be sailing when I arrived. 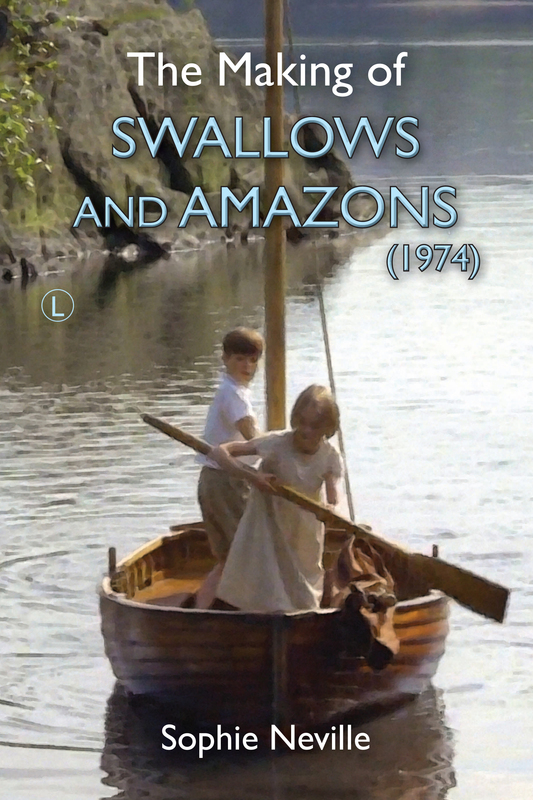 A number of vessels that appeared in the BBC TV adaptations of ‘Coot Club’ and ‘The Big Six’ entitled ‘Swallows and Amazons Forever!’ were on display at the club, including Titmouse, the dinghy belonging to Tom Dudgeon in the story, that normally resides at Hunter’s Yard in Norfolk. She is no longer seaworthy. 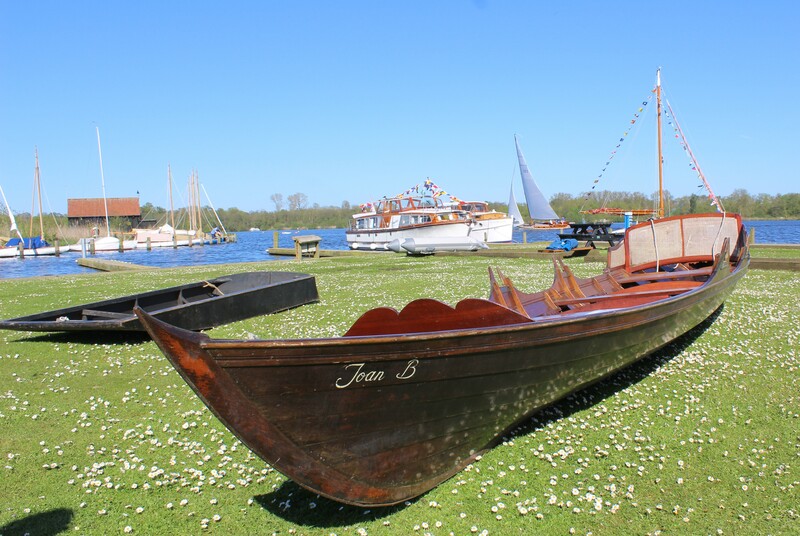 Tom’s punt, the Dreadnaught was pulled up alongside an elegant Edwardian skiff called Joan B that was once set adrift at Horning by George Owden. 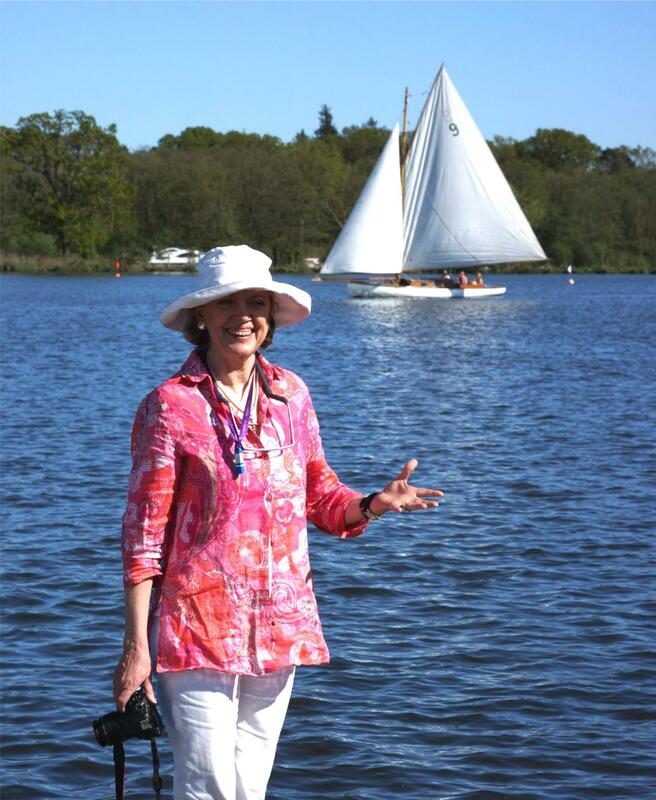 She had been brought along by Pat Simpson, a member of the Norfolk Broads Yacht Club. 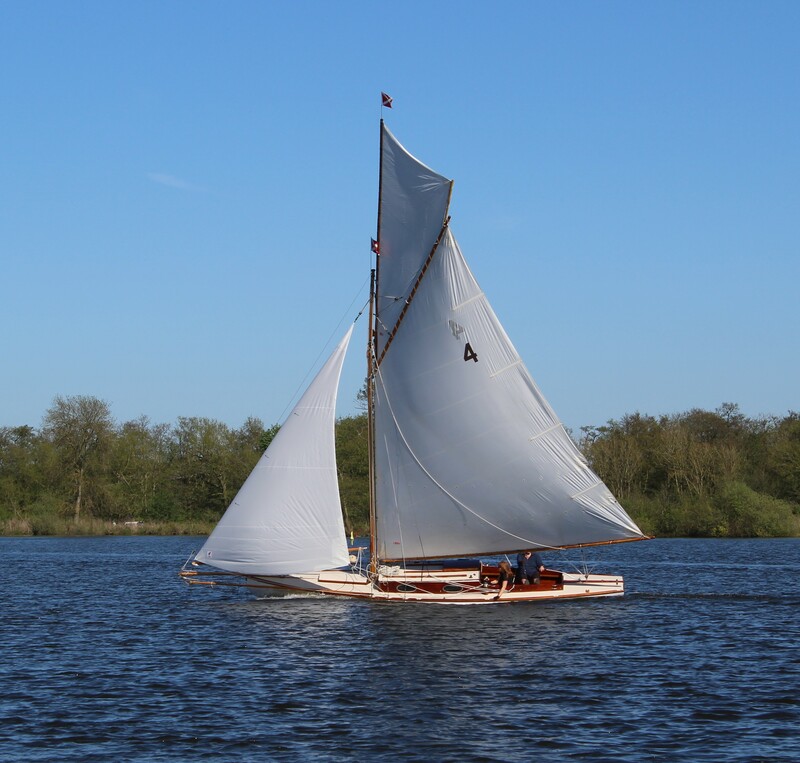 Pippa, a classic broads river-cruiser with dark sails belonging to Geoff and Rose Angell, was cast adrift at Horning in the dark of night. 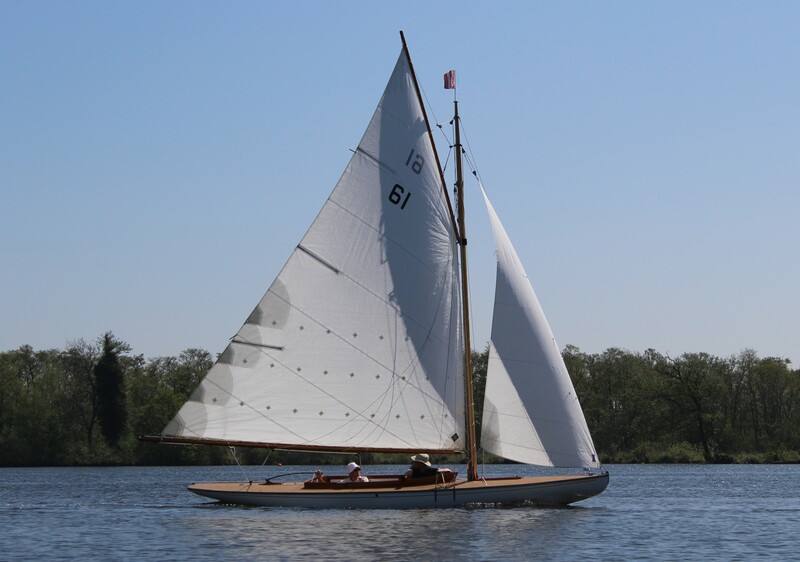 She came to no harm and was now out on the water, racing against a 1904 yacht with white sails, number 4, called Swallow. 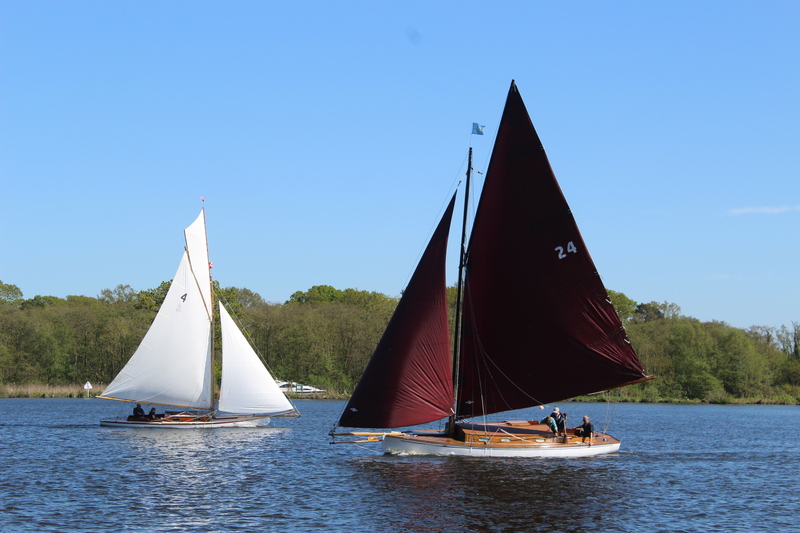 I spotted ‘Brown Boats’, a Broads’ one-design with a distinctive counter stern and spoon bow, which would also have been seen racing in the 1930s. They were first built in 1907 and although a few were lost during the war there are still 88 in existence, although some now have fibre glass hulls. Number 61, called Hanser, is owned by Danny Tyrrell. Lullaby, who played the Teasel in the series, was up at Horsey Mere with other from her fleet but we had her costume on display. It is a varnished transom painted with the name Teasel. 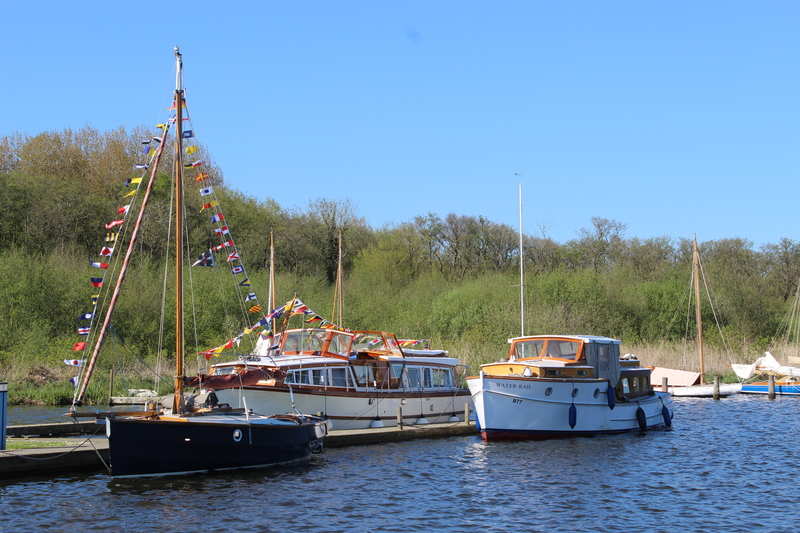 Janca, the motorboat who played the infamous Margoletta, hired by the Hullabaloos, was unable to come as she is currently being renovated, but Water Rail, a Herbert Woods Delight Class B 1930s cruiser belonging to Liz Goodyear was safely moored alongside other classic boats. She appeared in the back ground of several scenes in the television drama. 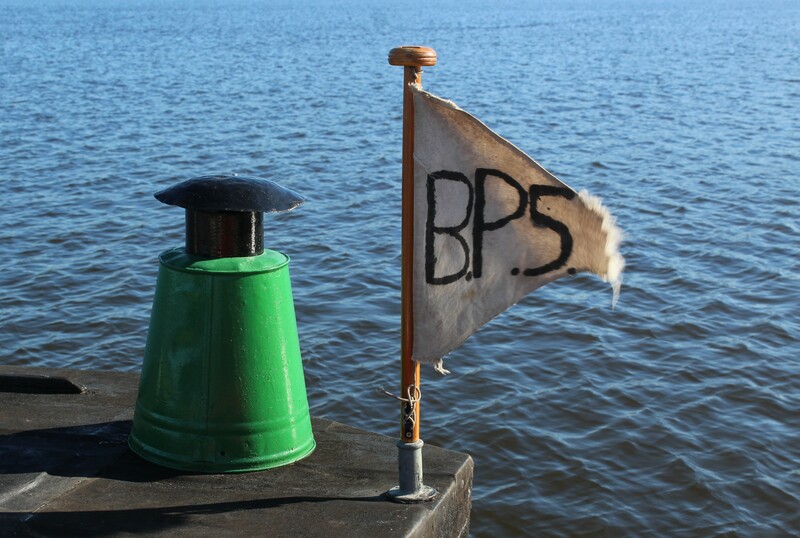 Bird Preservation Society – it was the flag belonging to the Death and Glory, flying next to ‘the little old chimney’ made from a galvanised bucket. 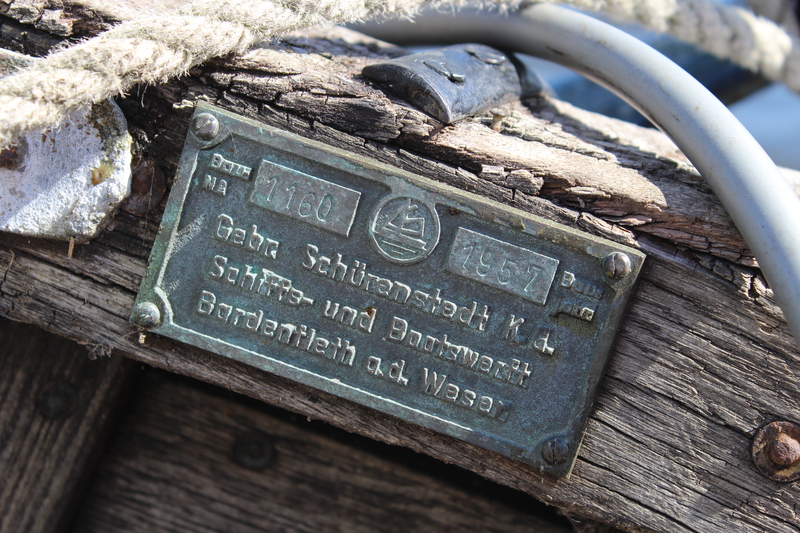 Originally a German lifeboat washed up on the beach at Southwold, she had been bought for the series by Pat Simpson of Stalham Yacht Services, who found her moored at Snape in Suffolk. 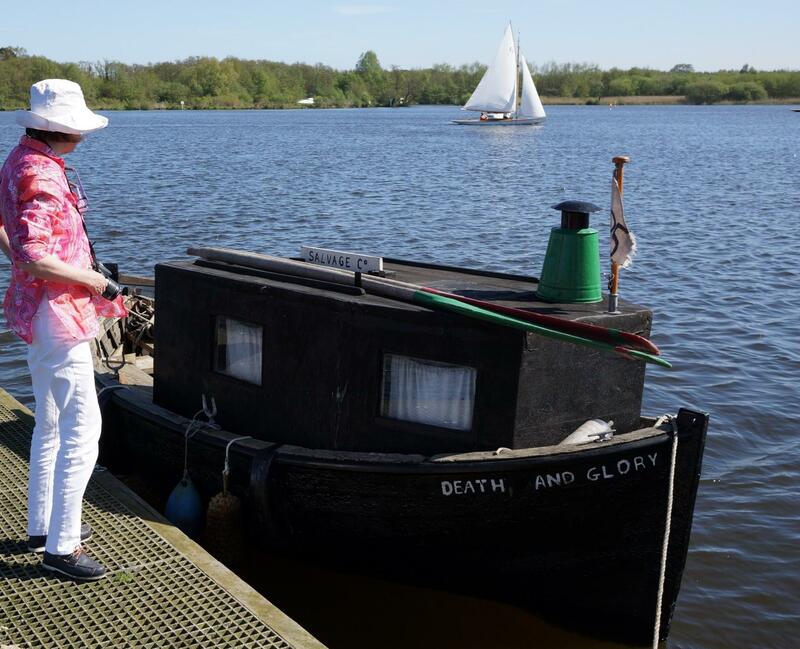 Pat kept her for his sons to take out on the Norfolk Broads and it has been operated by children as Death and Glory, ever since. It must have taken a bit of work to make her sea-worthy but tarred and fitted-out correctly, she closely resembles Arthur Ransome’s illustrations, the homemade cabin mysteriously larger inside than out. 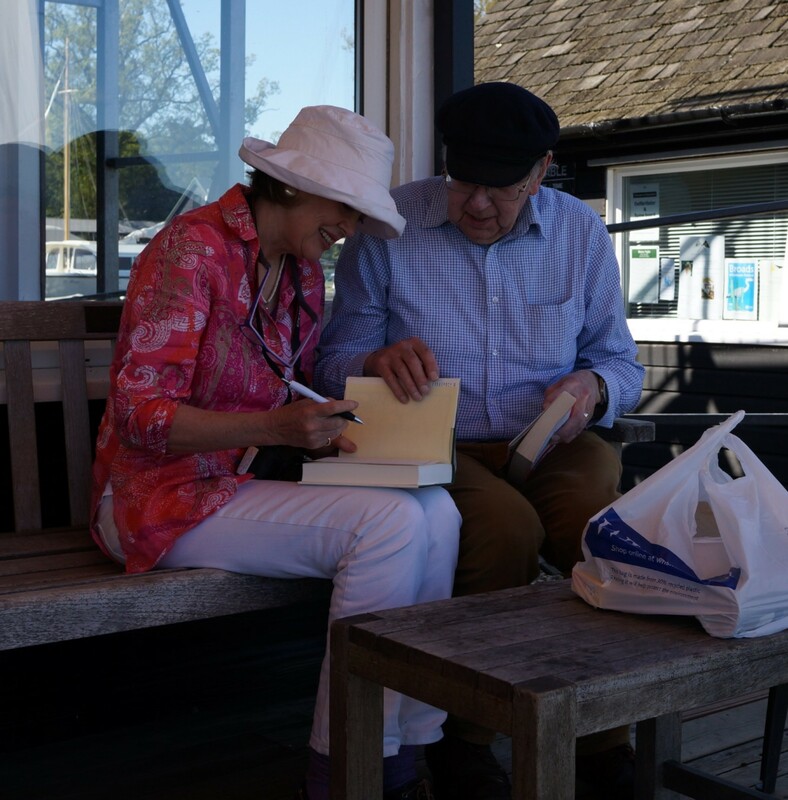 I was asked to sign a copy of ‘The Big Six’ bought along by Professor John Farrington from Aberdean, who acquired the Death and Glory for his own children in 1989. 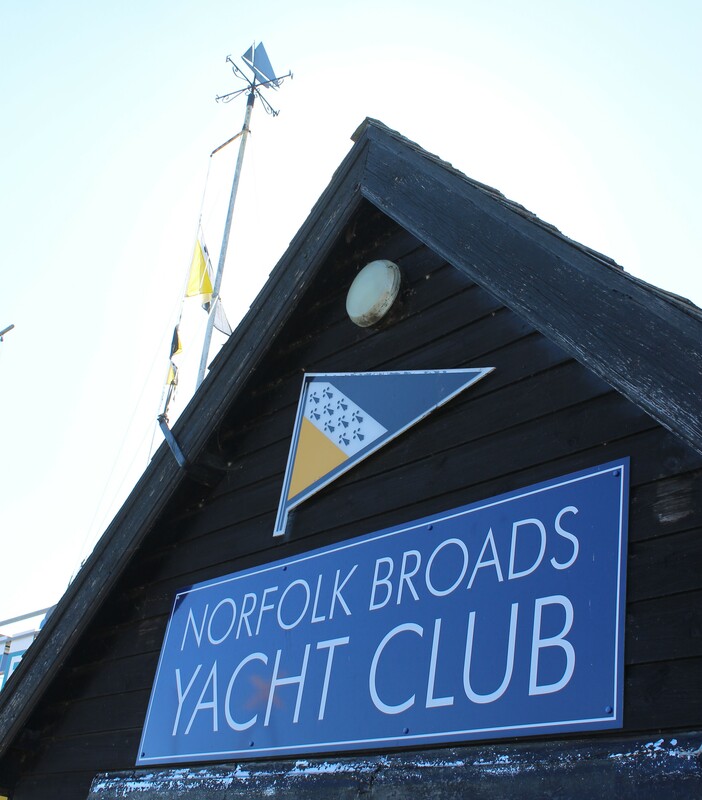 This year is the 80th Anniversary of The Norfolk Broads Yacht Club, which is why they have a 1930’s theme running through their calendar. 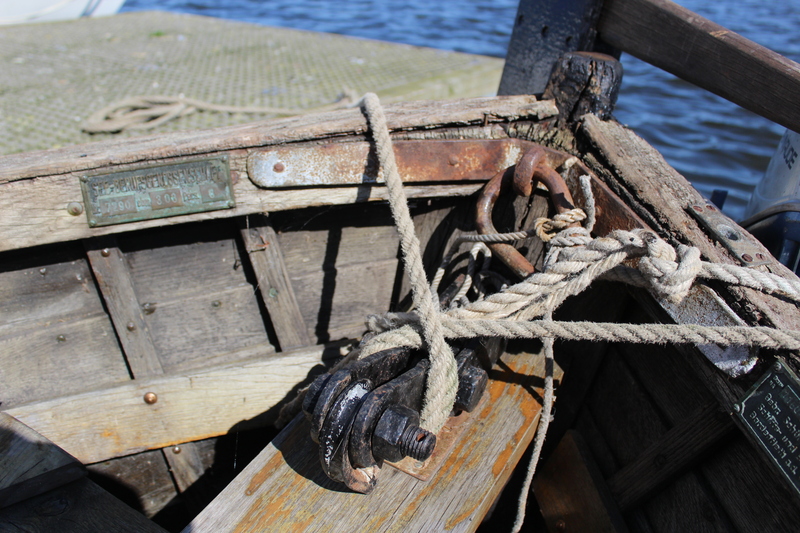 The day proved a true celebration of traditional boats that would have been seen back then. Do add any information about these boats or ask questions about making the book adaptions in the comments below. How much fun is THAT? TRULY AMAZING. Thanks for sharing. 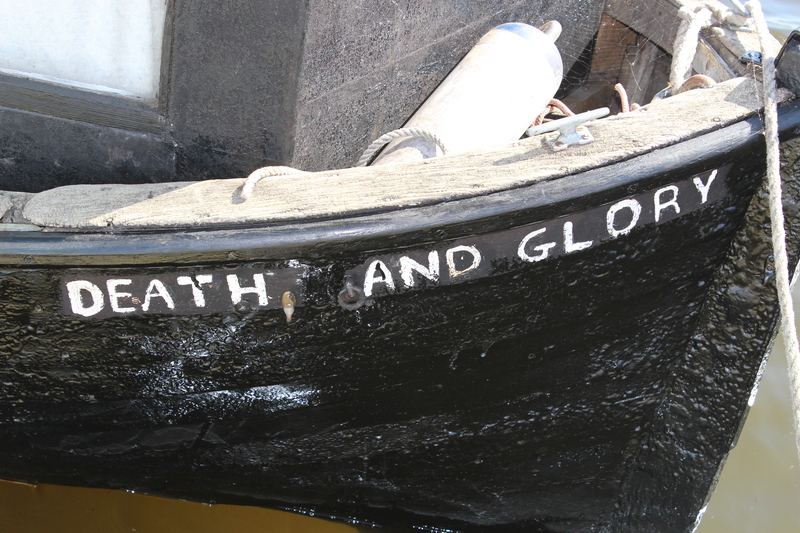 This is certainly the kind of story fans of the ‘Death and Glory’ would hope for such a proud vessel! And to think it is still crewed by young pirates. DELIGHTFUL. The young pirates are about two years old and six months, since it was bought for their mother and uncle, but they were there! What a pleasure to see all these elegant yachts and other craft! Everything looks just as I’d imagined. I wish I’d asked if I could have a go at rowing the Death and Glory! I was invited out sailing in Pippa. I’ll post the photos in a couple of weeks. Have you seen the DVD or read the books? Have definitely read the books, many times, and I’m fairly sure I have a copy of the DVD. Happy memories. This re-mastered version of the DVD is a huge improvement – worth getting! It was lovely to see the boats again. Have you ever been to the Norfolk Broads? Arthur Ransome’s maps and descriptions are so wonderful one feels one knows the scenes he depicts. I’ll write more about it all soon. My publisher came to my talk on ‘The Making of Coot Club and The Big Six’. we are wondering if enough copies would sell to make the publication viable. what do you think? It’s quite a niche subject although we had international stars featured such as Julian Fellowes who went on to win an Oscar for writing Gosforth Park. I’ll order a copy now. I would, too! Sign me up for at least one copy and perhaps several more, as it is difficult to get S&A items here in the States! Thanks for your encouragement! I need to put a bit of work into it and interview the cast. Caroline Downer has said that I can use the diary I made her keep! I have no doubt at all that a book on `The Making of Coot Club and The Big Six ` would sell – Put me down for a copy NOW !! A dear friend of mine , one of the founding members of TARS , now over 90 ,still plays her cassettes of `Coot Club` as one of her favourite A.R. books and would love to see such a revealing history . 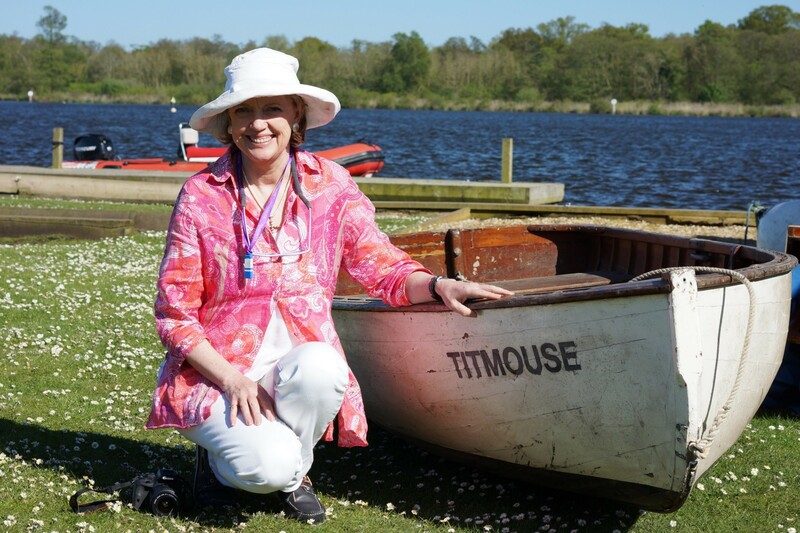 The pictures of boats on the Broads were brilliant ; sad about `Titmouse` but , like `Amazon` we have our memories ! I could gather a list at the next TARS IAGM at Coniston. Thank you so much for your encouragement. It needs a bit of work still, which means I have to put other projects on hold, but the bulk of the writing has been accomplished. Sadly , I am unable to be present at this years TARS IAGM but please put me down for a copy of the proposed book . I anticipate a long list of `readers -in -waiting ` ! !